Because he gets excited watching the mouse symbol skid across the screen, and in his enthusiasm to pounce on it, ends up pulling the 'L' key right off. Oh well --- my fault, not his, for trying to introduce him to the computer age. Now to find out how much it will cost to replace the keyboard, not to mention the downtime involved, and to see if it's worth it or if if I should struggle on for a bit with having to poke just that particular spot without the aid of a key. Edited to add (6 June): My helpful MacHead friend sends me this link of a kitten vs. Frontrow, which aside from being all cuteness and entertainment, makes me wonder what kind of person would let their pet unsupervised near a brand new MacBook Pro in the first place?? You're lucky Ink didn't actually pounce on the mouse as well after failing to catch the pointer on screen. Grouchy Monday blues in the office. PS: meebo.com doesn't work on my office PC! if it's still under apple care, should be free i think. otherwise very chialat. there are some authorised resellers who might have extra spare parts to clot in another L key for you. 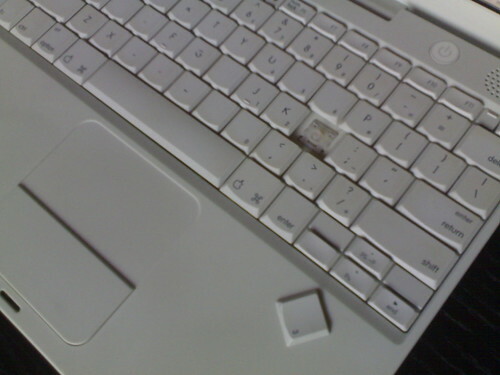 That's what happened to my bf's lappie before as well. Ouch!! Hope you can get it repaired for free! PS: Plse update your blogroll. I have to start a new blog cos the old one has logged me out. a book fell off my shelf in school and whacked the z key off completely!! but i brought it to the apple workshop in ang mo kio and they replaced it for free there and then, no questions asked. they had a drawer full of keyboard keys so they whipped out a z and put it back on! it took 2 minutes. It'll cost about 1.8k. It's called a Macbook. is it odd that i still find it slightly (ever so slightly) more cute than aggravating? then again, it wasn't my laptop. i found this, and thank god you weren't dumb enough to push the keyboard playing to this extreme.